We’re going to be highlighting a few tips and tricks from the Colette Sewing Handbook this month! To kick it off, let’s start with gathering stitches. Take a look below to see the difference between two and three row basting. Gathering is usually done with a basting stitch sewn on your machine. It can be done by hand but will take a good deal longer to do. To begin a basting row always back stitch after the first stitch. Backstitching at the beginning allows you to pull the thread at one end while it remains tacked at the other. Remember to pull from the bobbin thread which is less likely to break. When there are more rows, the gathers have a chance to be more even and controlled. With the three rows of basting the stitching line went between the second and third stitches. This shouldn’t be done on delicate fabrics or loose weave fabrics because the holes from the basting may be permanent. When sewing gathers, be sure that they are face up and at a right angle to the sewing foot, not angling off toward you. This will keep the gathers straight. Two rows of basting offers less control of the gathers. Note how large the ruffles are. The three rows of basting has more control and smaller gathers. Once sewn to a band, the fabric with two rows of basting have wide gathers and are relatively uneven. With three rows the gathers are closer together and more evenly spaced. What do you think? Would you use three rows over two? What tricks do you use when creating gathers on a garment? The Colette Sewing Handbook Announcement: read more about what’s in the book! Behind the Scenes: watch a fun video of the book photo shoot! Ooo- thanks for this tip. I often have a problem with uneven gathers – I’ll have to try this next time!! Wow, what a good trick! I always had this problem, can’t wait to try this! Wow. I’ve always done this with two rows and a lot of frustrations while trying to get it all evened out. Never thought about using three rows. Thanks for the tip! One thing I learned about gathering is to do the basting stitches in a different colour thread – preferably a very bright, obvious colour. That way when you go to pull them out, there is absolutely no confusion about which threads to remove. Thanks for sharing, Annie, that’s a great tip! This is one trick I actually knew but am usually too lazy to use! The contrast of seeing the results side by side might convince me otherwise, though, next time I need to gather fabric. Inexplicably, it never really occurred to me to do a backstitch at the start of the gathers; I’ve always left the threads long and then pulled from either side, which is definitely more difficult than doing it if there’s a bit of an anchor in there, so thanks for that! Wow, I am such a beginner! When I’ve needed to gather, I’ve only used one row! I’ll definitely be using this tip. I think, this is one of the things that you’ve meant in the interview: ‘My concept was to build on the sewing fundamentals that are so often overlooked’. This is probably one of them. I’ve never done it this way, as I learned sewing from my grandma and she used to stitch only two rows of basting. 3 definitely looks better! My granddaughter (one day in the far future) is definitely going to learn to stitch 3 rows! I never even thought of using three rows! It looks much nicer. When I made my latest gathered skirt I had such troubles with all the gathering. Thank you for the post! I just received my copy of the handbook, yesterday, and I learned so many things I didn’t know in just the FIRST section (and I’ve been sewing for years)! This gathering trick was one of those things. I absolutely LOVE your book! Makes me wish I hadn’t of wasted time making all of my clothes the wrong way over the years – ha! Oh, gosh! I sure wish I had of thought of doing three rows of gather stitches instead of two when I finished off my daughter’s dress on Monday. While I think it turned out ok, looking at these examples – I feel it would have benefited greatly from three rows. Oh well! Next time! One thing which puzzles me is that pattern directions so often tell you to put the second line of gathering stitches at the seam line. And then you’re supposed to gather right on the second line of gathering stitches. I put one line of gathering stitches above the seam line and the other one below it. Then I stitch the seam between them. The gathers look much nicer and you only really have to pull out the bottom row of gathering stitches. I get a similar result to your using three rows, but I’m going to take your suggestion to see if it will look even better. Yes, I use the two row method, one row close to the selvage, the other one about 2cm in. Once gathered I sew the seam 1.5cm from the selvage. I’ve honestly avoided gathers because I can never get them to look right. So I’m going to have to give this a try for sure! Wow – I would have never realized that one more row could make such a difference! Thanks for the visual. It really shows the difference. Loved to watch ‘behind the scenes’ and see the dresses actually worn and moving. You must have had so much fun!!! I agree that three rows looks better, but if you look between the gathering rows, it is about the same. That’s where the most control is and where I usually try and make my final seam. Give it a try! This will come in handy! Thanks! This is so timely. 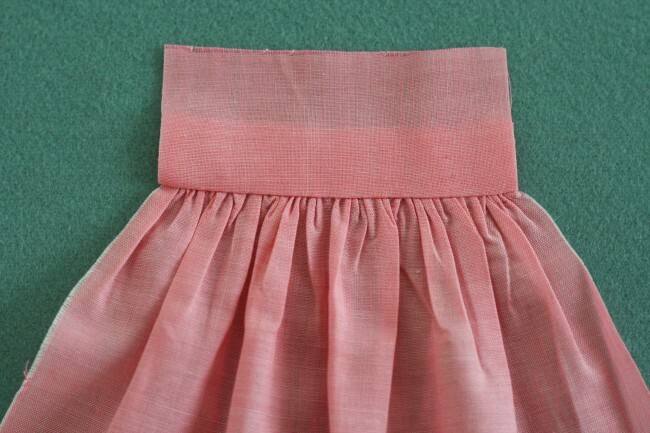 I’m going to finish my dress tonite and have to do the skirt…I’m going to try this out! The proof is in those pics, definitely! Wow! This post is making me want the book right away! Would the 3 row approach work just as well with knits? Wow, thank you so much for this post! I’ve always disliked how imprecise gathering is and I think you’ve illuminated the trouble I was having with the 2 lines of basting! I’m motivated to try another gathered project now in order to give 3 lines a go! It’s been a long time since I’ve done gathers, but I was definitely taught to use two rows. It makes such a big difference for such a little change. My handbook arrived today, and I’ve been poking through it ever since. I love the Truffle dress! Wow, and I thought I was being sophisticated using two lines instead of one! I usually do one row on either side of the seamline, where do you place the three lines in relation to it with this method? Oh! I read the post a bit more closely and I see you say the seamline goes between the bottom two rows? I’ll definitely try this next time I’m gathering! Wow! I think this just changed my life. It never occurred to me to do three rows, but I will definitely do this from now on! Thanks for the great tip. 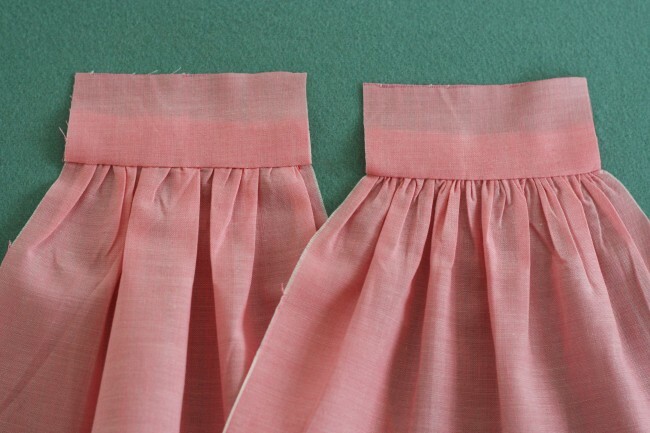 Can you show a picture of the gathered fabric sewn to the waistband from the other side? I’m a self-taught sewer and I find that when sewing my gathers I’m never sure what to do – do I let the machine run on and flatten down the gathers or do I try to smooth them out as I go? I’ve tried both with imperfect results. Whatever you’ve done, the 3 rows look lovely. Thanks Marike, this looks great and I especially like the part about adjusting with an awl or needle. I found the same tutorial that Marike mentions above and it is one of the best sewing tips I have found online. Every other single sewing book/tutorial I have come across always recommends using a longer than normal stitch, except for that one tutorial. I now use a 1mm to 1.5mm stitch, with my tension set to almost zero and have found that gathers are now just so easy to do. The long stitch/loose tension combo needs to disappear and the short stitch/loose tension should be mentioned everywhere possible. No need for three rows and no need to backstitch at the beginning of each row. Simply sew one row, pivot 90 degrees and sew a couple of stitches, then pivot again and sew the parallel row of stitches. No muss, no fuss. I suppose for machines that don’t have alterable stitch length, such as my first machine, the third row of stitches is probably a good idea, but if you can alter the stitch length, then the short stitch works so much better. Okay, so I did my skirt (of a dress) last night and tried this—it worked out great! I made the mistake of forgetting to backstitch and ended up pulling out all the thread to start over, but the end result was a really nice tight gather. Pulling out the 3rd line of basting that was left exposed was a bit of a pain, but hey, I’m impatient and am pleased with the final result. Love the book—thanks so much for all your hard work and generous sharing on your blog! I’ve always done three rows of stitching, but haven’t tacked it at one end. I leave a long tale at the end and then wrap it around a pin in an eight shape to keep it there. I also gather from both ends of the fabric and have found that it leads to a lot less broken basting lines. Then again I’m also gathering textured fabric and lots of it for costumes. Actually, I often leave long tails at both ends myself, unless I’m just gathering a small section. So I think the backstitching is optional. I wish I knew this a few weeks ago when I was making my first gathered skirt! I still love the skirt but I really wish the gathers were more even. You never fail to come up with little tips and tricks that seem so simple, but make a world of difference in our sewing- I can’t wait to get your book! I use the zig zag over a cord method, like what Claire suggested. I zig zag with regular thread over the top of top-stitching thread. It works really well in terms of getting the gathers even. Sometimes though, when attaching the gather, the fabric folds over and I have to unpick and re-do that part. Next time, I’m going to try sewing between the zig zag and another line of long stitches to see if I can get that attachment perfect first time! This may be the ultimate gathering technique (for me) of all time! I also sew over a cord. Its alot faster and you don’t have to pick pick pick at each little stitch. Its easier to take it out too, and you have more control over the gathers. Also, if you hold the fabric behind the needle as its coming out, the machine will gather it somewhat, which is good for fitting sleeves and such, it comes out perfectly. Wow! This is awesome and just one of the many exciting reasons why I cannot WAIT to have a copy of your fab book! Soooooo only going to use 3 row ruffles from now on. I cannot get over the difference! Thx for the tip! Wow. I actually took and am now certified in Dressmaking and Design. But they never taught me to gather with the three rows, just long threads at both ends. I took this course so that I could design aprons (proceeds to abused women’s shelters). I wanted ruffles on some of the aprons, but hated the process. I can now make mini ruffles for my matching mini aprons (yes, mini, as they go on your soap bottle in the kitchen to match the cook’s apron. I am headed for the sewing room now. 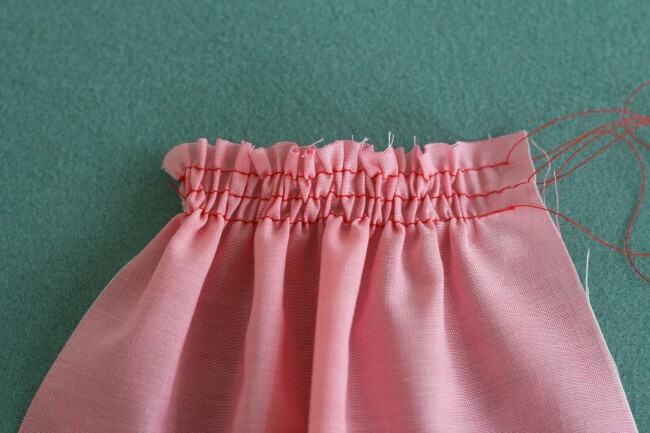 I was taught the method of a zig-zag stitch over a length of buttonhole thread. And I always hated it, so learning the two rows of basting was itself a revelation, three rows even more so. My one trick, when gathering longer lengths (such as a dirndl skirt) is to break up my rows into fourths, so baste 1/4 of the length, leave a tail, repeat around. I’ve found I can keep my fabric gathered more evenly around the whole garment and it feels less like fabric wrangling (fewer gathered clumps). Holy Moly! I tried this and it worked like a charm! I’ve been sewing for 30 years and can’t believe I didn’t figure this out on my own. Thanks for a great tip. This is how I learned to gather in high school; dare I admit, back in the late 60’s! I teach the two row method, just because I thought maybe it was passé to have my students do the three rows. I’m definitely going back to old school! Sometimes tried and true is better. Thanks!!! I just read Jennifer’s comment about back stitching at the start because she doesn’t like the gathers dropping off the other end. I still prefer NOT to back stitch as I prefer to pull up the gathers from each end (less chance of thread breaking when it’s a long stretch of gathers). 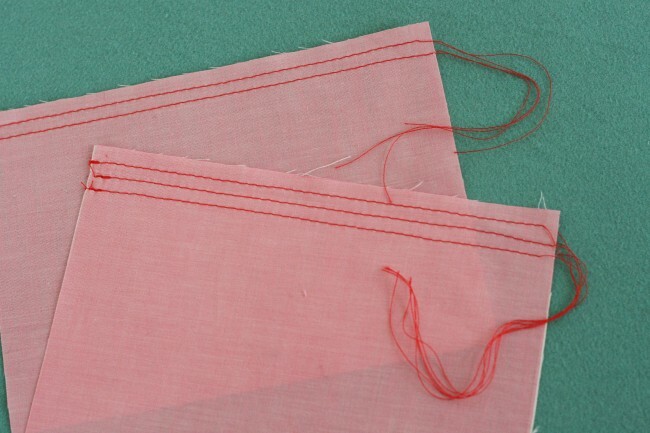 The way to prevent dropped gathers is to place a pin at each end of the stitches, perpendicular to the line of stitches and then wrap the thread tails around the pin in a figure 8. I even sew OVER those pins with the figure 8 thread tails still wrapped around them, and I don’t usually sew over pins!!! 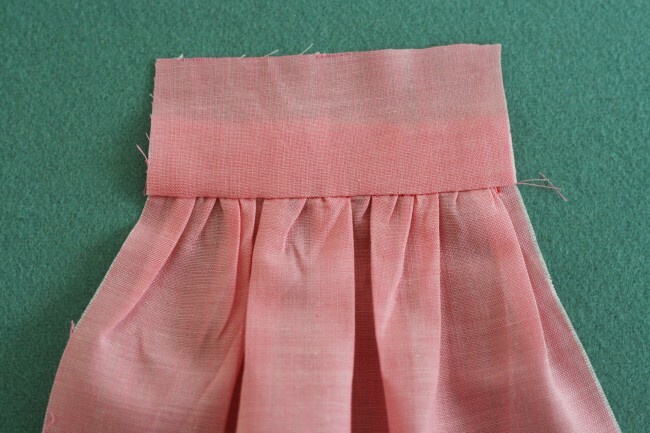 As I sit here reading the tutorial for gathers, I am finishing up a three tiered gather little girls skirt:) I have always used two rows, and can see where three rows of basting stitches would be most beneficial on most fabrics. I’ve used most methods mentioned by everyone, but do use the 3 rows most often, but….when I have time and I’m making something extra special I use my Amanda Jane pleater to pleat about 5 rows. Makes very even and almost perfect gathers. Just mentioning this method in case some of y’all have a pleater or access to one. Thank you so much for this tip! I am going to try to remember this for my next project – I don’t think I can use 3 rows on my current project because I am sewing with double gauze which is a bit too loose. This is so funny, because I always use to gathered with only one row of basting, and when I switched to two rows it changed my world! I personally think that three rows of basting is over kill, and maybe a waste of time. If you gently tug at the fabric above and below both rows of basting it creates perfect little gathers, and if you sew your final row of stitching in between the two basting stitches, you will have perfect gathers with only two rows of basting. The size of gathers has nothing to do with how many rows of basting you use, but depends only on how much fabric you’re gathering up! The more fabric you are gathering into any given space the tighter they will be; less fabric will equal less gathers. Alyssa, I think you can see the difference in the two examples at the end of the post, though. They are both the same size, same amount of fabric. How it works is that three rows produces more stitches per inch, which results in smaller gathers. 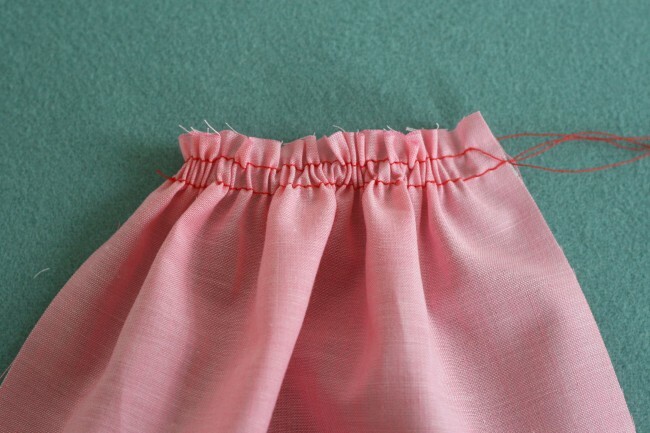 You could get the same effect by using a short stitch length, but that might make it harder to pull up the gathers, especially over a long piece of fabric. I’ve also found that using a shorter stitch length helps give more control with gathers. I used to use 6mm but have now changed to 4 or 4.5 mm. It makes a big difference! I meant to add that I decrease the needle thread tension with the shorter stitch length, which helps pull up the bobbin thread without breaking it. I do 2-row basting, but I mark and pin the fabric evenly along the band before gathering it so it will be evenly spread. And I take the time to make sure the lower row is as tightly gathered as the upper row. If you look at your 2-row example, it was badly gathered before the seam went in. Thanks for sharing these tips, they are really useful! I never tried the three rows of basting, but for sure next time I’ll use this technique, so much neater!